Check out our Table at the 2014 Clear Channel KIIS FM Grammy Gift Lounge with Hollywood Swag Bag and the fabulous celebrity tweets! 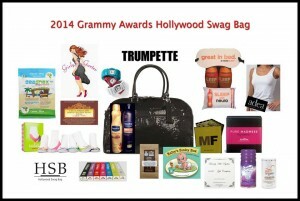 Hollywood Swag Bag is proud to have the following sponsors for our 2014 Grammy Gift Bags! 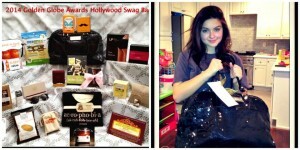 Ariel Winter Poses with her SAG Hollywood Swag Bag and helps Give Back! Golden Globe Nominee Ariel Winter helps Give Back by posing with her Hollywood Swag Bag! Thank you Ariel! Maisie Williams Tweets Photo of her SAG Hollywood Swag Bag and Gives Back! SAG Award Nominee Maisie Williams of Game of Thrones tweets her Hollywood Swag Bag Photo helping launch a HUGE Give Back. Stay Tuned….